I love walking around historical monuments and after a friend mentioned Euromos I decided to head there on a day trip. I was told it was old ruins that were definitely worth a look in. Now, let’s get straight to the point here. 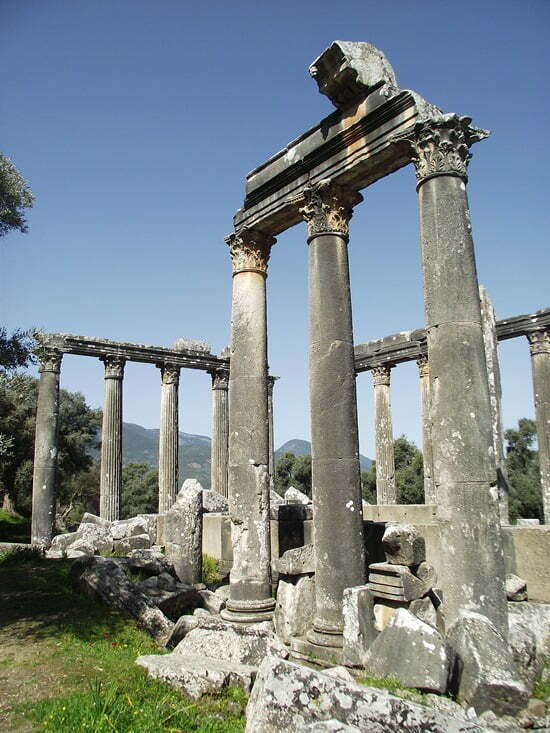 If you are passing by the Euromos ruins while on the Bodrum / Milas road then do stop off to take a look. Take a couple of photos and get back in your car again. Don’t however, make a special trip. I did and was seriously disappointed. 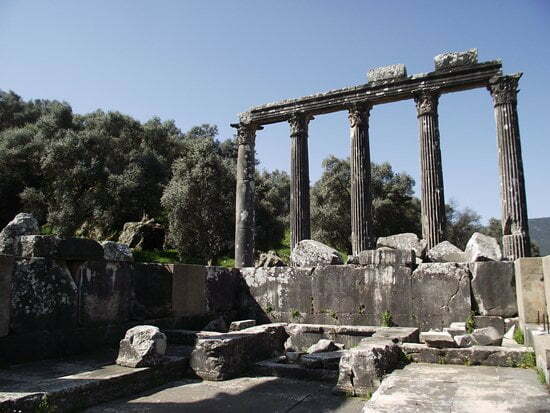 The old ruins turned out to be eight columns and regarding size, the width of my two bedroom apartment is bigger. While I was not impressed, it seems that others were. A coach load of German tourists drew up and gasps and amazements made me wonder if I was looking in the wrong direction. What were they getting excited at? They loved Euromos. I could not understand their conversations but the thoughtful looks and arms pointing in every direction proved they thought it was amazing. A friend had told me about tree houses at Euromos. I had images of a little village all living in the trees and off the land so I set off to find them. After an hour of walking around the countryside and stepping in more goat s*** then there is on a farm, I gave up. No tree houses were to be seen and no people were about either. The ruins were all there was to Euromos and I was charged eight lira to get in. Perhaps it is the fact that I’ve seen many ruins in Turkey and once you have seen Ephesus, anything less than that is impossible to get excited about. Perhaps a guide would tell stories of the old days and explain exactly what these ruins were. 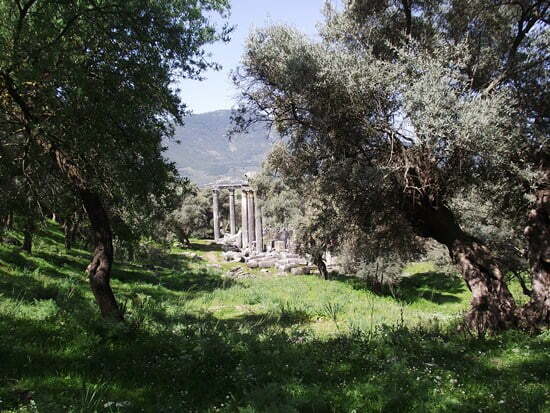 I knew the ruins were the Temple of Zeus but with little other information to go on, it was hard to get excited. I don’t understand the people who call it one of the best preserved monuments in Turkey. While others may be impressed, I certainly was not. Photographs excellent but I do not agree with your comments. having spent many hours visiting the site. Did you visit the amphitheatre and the town remains in the surrounding hills and area? I agree, it is not Ephesus to which I have also paid a visit. It is one of the hundreds of minor sites one can visit in Turkey without the teeming masses and where one can learn/experience past cultures in peace and contemplation. And I accept each of them for what they are. 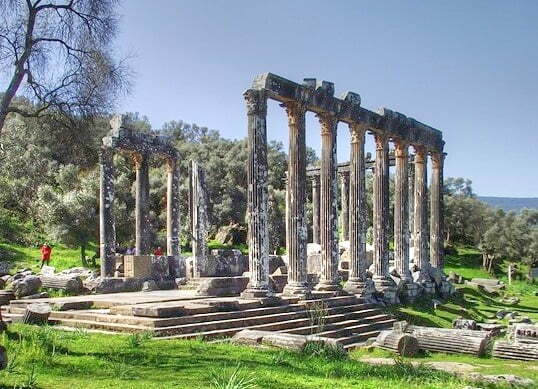 I am grateful that Turkey, in spite of its problems, is managing to preserve these sites – for all the people. In the UK we have Stonehenge! – from which I suspect EH would like to ban all people in a 3K meter radius Euromos has far more to offer and there are a further hundred like it. I think the label it has of being ‘one of the best monuments in Turkey’ is almost certainly qualified a bit more. It is one of the best monuments of its type and age in Turkey. It’s a shame there is now an entrance fee at Euromos. I used to stop on my way to and from Izmir and enjoy the peace. Now I’d think twice if I had to pay 8 TL. 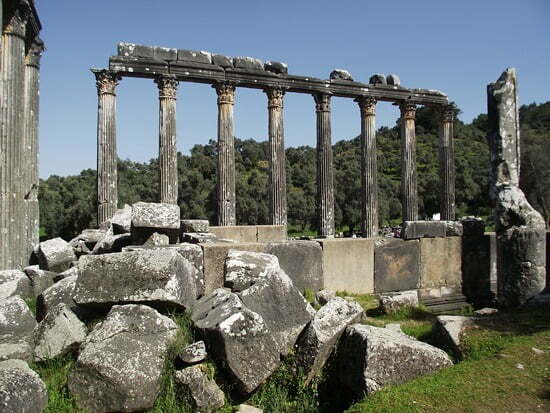 Maybe you’re right that you had seem so many ruins already, so Euromos wasn’t that big deal like the other tourists. It’s the same feeling I got when I saw so many church in Rome, i kind of had enough. But if I started to read my guide book, even the smallest church can be very interesting. Thank you for the share girl. Glad you liked the shots Nancy. Feel like I am getting better with my photography. Slowly but surely! Maybe not the most exciting looking historic landmark, but some great shots. Love the blue sky against the ruins. @Turkeys for life – I think the German toursits had a guide and explained it all to them which added to the overall effect. Cheap skate that I am, I did not think I would need one! @Pete – Thanks Pete. I thought I would put my camera through its paces! @Roving jay – Thanks Jay. I think other people must of thought I was crazy crawling around in flower beds! … well you took some good photo’s … so not a wasted trip! I love the last two — nice angles on them both. Like how you have the flower in focus and the ruins as the backdrop. Despite you not be overly all that excited or impressed about these ruins, you still took some wonderful photographs. Amazing that places like this still exist. Turkey is just amazing.